Your issuing Police or Sheriff's Department requires that all renewing CCW permit-holders attend and pass a CCW training course. The curriculum for that course must include lessons on gun safety, permissible use gun laws, a written exam and a shooting proficiency exam. Our class is designed to exceed the curriculum requirements set by your issuing county / jurisdiction. 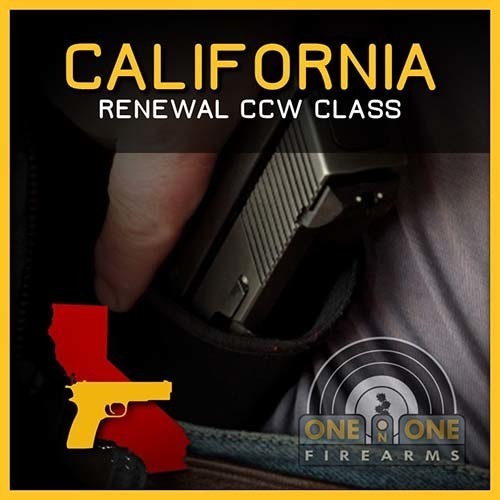 This California CCW 4+ Hour Refresher Class is recognized by Sacramento, Yolo, San Joaquin, Placer, El Dorado, Nevada, Amador, and others*. This class includes qualifying with one handgun. Additional gun qualifications are $10 each and can be purchased through this website or during class. Most departments limit the number of guns you can have on your permit to three at any one time. Note: Range fees are the responsibility of the student, and can be paid directly to your Instructor on range day. COURSE OPEN TO: Any student qualified to renew their California Concealed Carry Permit. Students should be actively engaged with their issuing county / jurisdiction in the CCW renewal process. AM - Sacramento Valley Shooting Center | 15501 Meiss Rd. Sloughhouse, CA 95683. We will break for lunch at approx. 2 PM. Students will have 1 hour to get lunch and return to the classroom on Rockingham Dr. RANGE FEES: We will collect range fees from each student from $7-$16, depending on SAC VALLEY SHOOTING CENTER membership status.